One of the persistent rumors following the Samsung Galaxy S10 is the inclusion of an in-display fingerprint sensor. Given what we’ve seen from the leaked images, none of which seem to show an exterior fingerprint sensor, it makes sense that Samsung could be turning to the use of an in-display sensor. Now, in new images discovered, it shows the Samsung Galaxy S10+ with what appears to be an icon for the in-display sensor. This icon shows where users will have to place their fingers on in order for it to scan and unlock the device. So far, the rumors are claiming that both the regular Galaxy S10 and Galaxy S10+ will feature the in-display sensor. 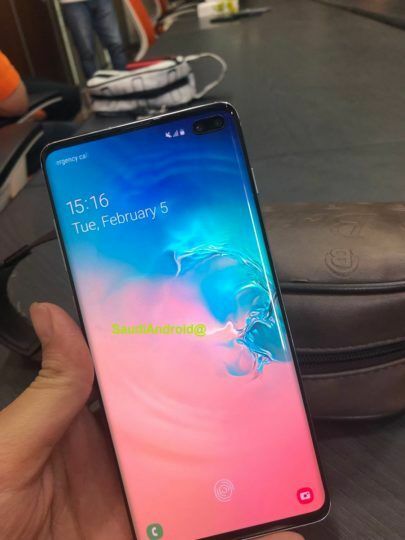 While the budget Galaxy S10’s photos don’t show any external fingerprint sensor, apparently it will reside in the side of the phone, which means that the budget Galaxy S10 will be sitting out on the in-display fingerprint sensor feature. That being said, we are curious as to how Samsung’s sensor will work, but we guess we’ll have to wait until the 20th of February for the details.